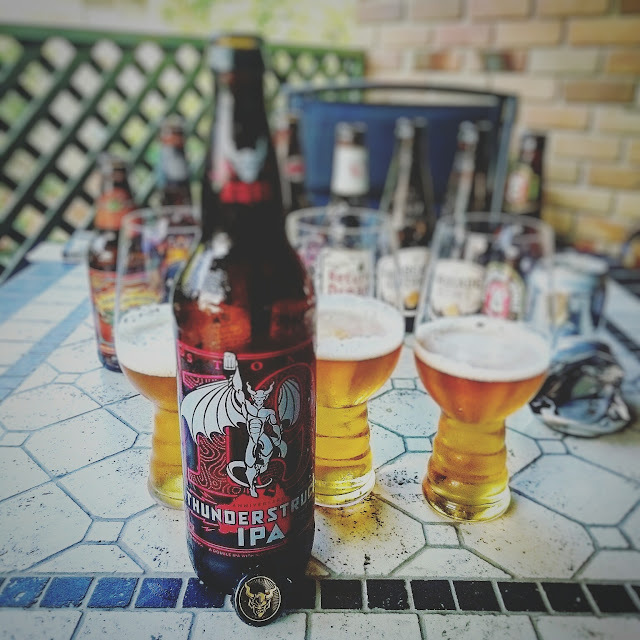 The Balcony Brotherhood: Social Drinking, Craft Beer and You! For your average person, working a full time job or studying and sharing a life with a partner or having children can seriously reduce your time to hang out at bars, go out for dinner or simply catch up with friends. On a recent RDO (Roger Day Off) I was able to find some time to spend an afternoon with two appropriately beery lads in the Canadian-almostbutnotquite-Australian, Brews and Bacon and the handsome specimen that is Chasing Ale. It's the bringing together of beer and friendship that can really create a fun, laid back atmosphere and this case I was a sort of casual observer of a Blind Tasting being performed by Bacon and Chasing for which you should be able to read more about soon on their respective blogs. 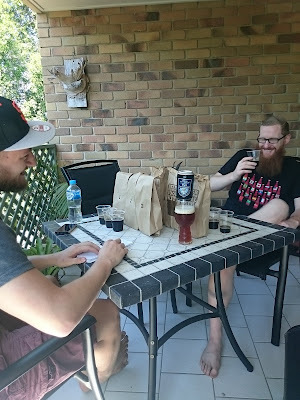 Chatting, listening to a few tunes and sinking a few quality IPA's whilst watching the boys chew through a few less than stellar stouts and mull over their tasting notes was an entertaining afternoon for yours truly. 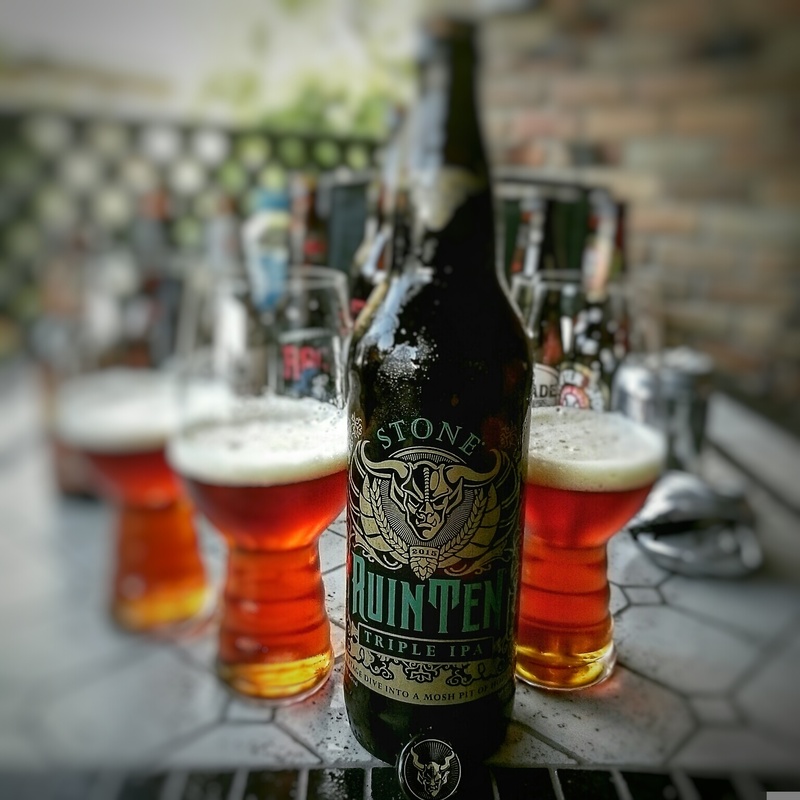 As the day wore on we moved onto a couple of big bottles I had been saving to share in Stone's RuinTen and Thunderstruck which were both pretty delicious beers and probably acted as a good palate cleanser after a bunch of stouts. 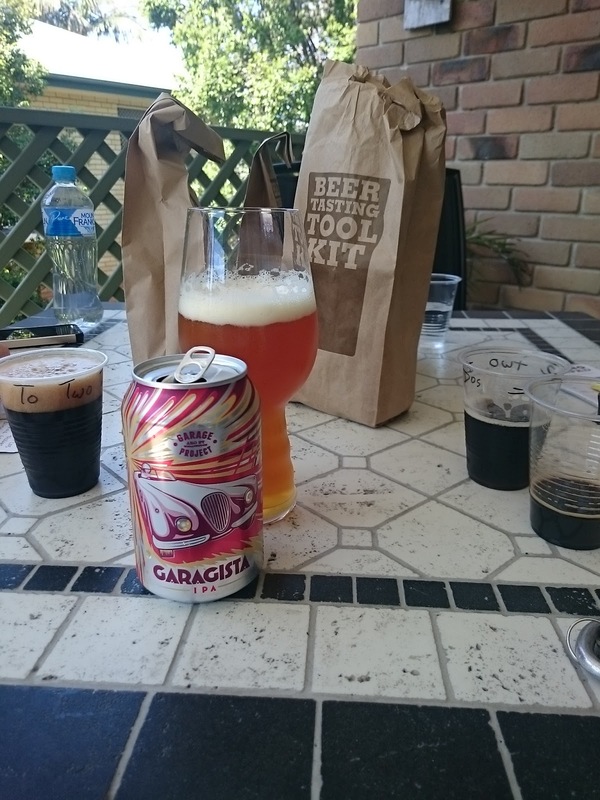 The enjoyment of the afternoon really made my think "why don't I/we do this more often" and them realisation that I don't genuinely sit down with good mates and drink beer enough. Certainly not compared to how many brews I Insta-Blog whilst sitting in the apartment with the girlfriend. So as a human on planet earth with the ability and freedom to choose what I do, I intend to make more of a conscious effort to engage those who I call 'mates'. So if you are suffering from a similar experience to me, find a balcony, preferably one you or your mates own.. and then grab a few of those mates and some crispy, dank or dark brews and chill out an embrace the friendship that like-minded beer buddies bring! It's not that often that I venture out to a coffee shop and it's not that I don't love coffee because I really do it's just that I tend to be eating breakfast at home which almost always contains a coffee so when I do get out it's usually for lunch or dinner. Sometimes though it's nice to find a good coffee shop and one that's close by to where you live is always a good thing, that's where Dandelion & Driftwood comes in. Located on Brisbane's often forgotten North-side, down an inconspicuous (but very pretty) suburban street this small, quaint coffee shop sits. It was a weekday when we visited and fairly late morning so there wasn't a lot of people but I imagine on a weekend morning this venue gets full fairly fast. There is a couple of tables out the front, a few out the back in a courtyard area and a few two seater tables and one big bench inside. It was a warm day so we chose to sit inside with the air-con and ordered a coffee to start. 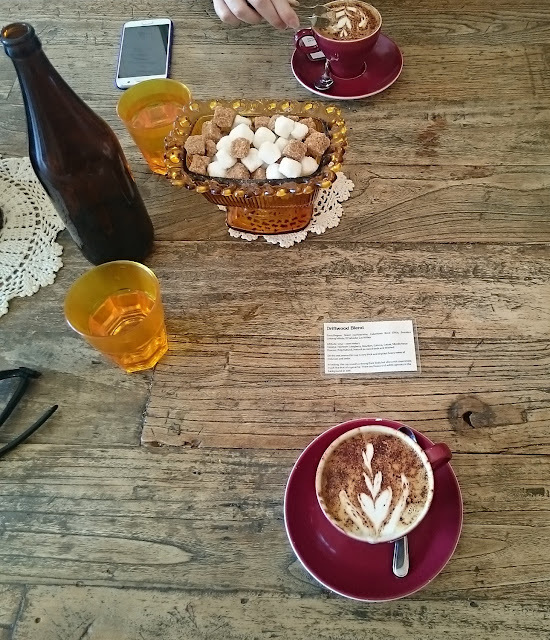 Dandelion is a full on legit coffee shop with it's own blends and roastery and if like me you don't really know the in's and outs of coffee this can seem overwhelming but a short chat with the friendly staff will sort out a blend appropriate to your palate. If nothing else a visit to Dandelion has made me hungry for a full education on all thing's coffee especially as a lot of the bitterness, grassy and earthy tones feed into beer's malt characters. Now it's not just about Coffee there is also a nice range of Teas and a fairly extensive food menu for such a small venue! I'd been craving a good waffle lately so we decided to order both a savoury and a sweet to share. 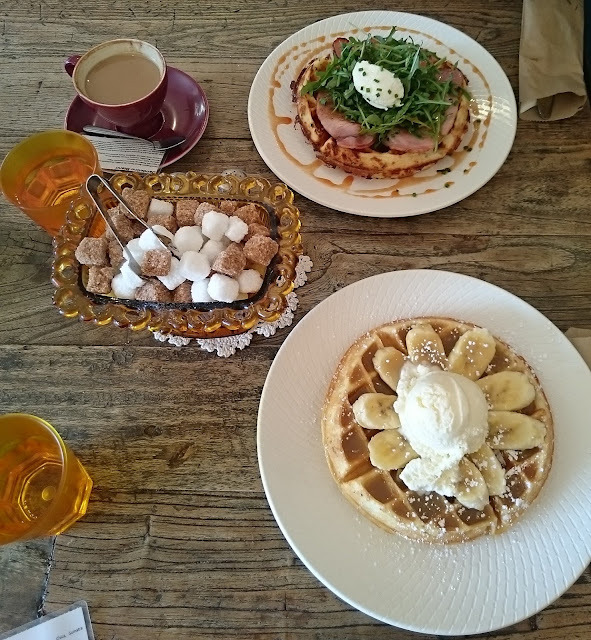 We chose the First Crack which was a cheese and chive waffle served with bacon, rocket, blend smoked honey and cream cheese and I can tell you that it was hands down the best waffle I have ever had and I can't wait to go back for it again. Our sweet choice was the 'Extract the Sweetness' which was a delicious fluffy waffle with sliced banana and house-made caramel fudge sauce with vanilla ice-cream. I'm not a huge fan of banana but the combination with the caramel and the ice-cream made this pretty amazing. I'm glad it was a quiet day when we visited as it was great to chat to Peter about the business, blend smoked honey and even a little bit about the relationship that coffee and beer has. Can't wait to pick another quiet mid-week day or late weekend morning to visit again and can't believe that I hadn't been to Dandelion before now!